Tomorrow (Tuesday) the House Judiciary Committee members will debate and vote on investigating Donald Trump and his administration thanks to Democratic Representative Jerry Nadler's clever resolution of inquiry I wrote about here a couple of weeks ago. 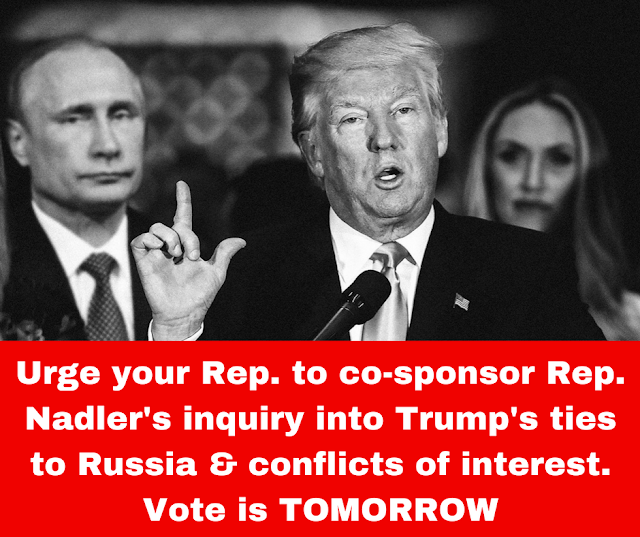 That means you need to call your Representative TODAY to urge him/her to co-sponsor Rep. Nadler's demand that the Department of Justice turn over all relevant material about Trumps ties to Russia and his tax returns. 1. Find your Rep's number(s) here (and add it to your activism cheat sheet or just put them all in your phone if you haven't already - makes calling a heck of a lot easier). 2. Check to see if they've already co-sponsored Nadler's inquiry (111) here. 3.. Here's what you say - remember to be polite: "Hi, my name is NAME. I'm a constituent calling from TOWN/CITY. I'm calling to urge Rep. NAME to co-sponsor Rep. Nadler's resolution (number 111) of inquiry into President Trump's ties to Russia, conflicts of interest and ethical violations, including turning over his tax returns." The staffer should tell you they'll pass that along (and they may ask for your address), after they do, press them a little for more information by saying, "Can you please tell me if Rep. NAME has already signed on to Rep. Nadler's resolution?" Unless your Rep. has already signed on to Nadler's inquiry, in which case you should ask them to say thank you, the staffer will just say they don't know. If that is the case, you can close by saying, "Please tell Rep. NAME that I urge him/her to put the safety and sovereignty of our democracy ahead of party affiliation and that I will be paying attention to see whether HE/SHE stands up for our country." Always be polite and friendly. 3. Report back. MoveOn is tracking people's reports of their calls and it only takes a second to share a quick report of your interaction with your Congressperson's staff. 4. Share this post with anyone you think will join you in calling. More info below if you'd like it (via MoveOn). Nearly every day, more and more questions surface concerning Donald Trump’s ethical violations and questionable ties to Russia. Donald Trump has refused to step away from his business interests in any meaningful way. Trump's foreign entanglements are likely unconstitutional. He has repeatedly refused to disclose his financial assets, and he is severely compromised by known Russian interference in our election and by continued revelations about ties that he, his campaign, and his administration might have to Russian officials. Rep. Nadler's resolution represents one of the best chances we have right now to pull apart Trump's web of corruption and foreign entanglements.